The log cabin block is ripe for modern reinterpretation and modern quilters have seized that opportunity. The traditional pineapple log cabin is up for a modern redo as well. The pineapple log cabin block is typically paper pieced, but this modern version is free pieced with stitch and flip triangles creating the signature triangles that characterize this block. When you’ve learned the technique you’ll be able to make a half log cabin version as well. You’ll need your cutting mat, rotary cutter and your standard piecing supplies. 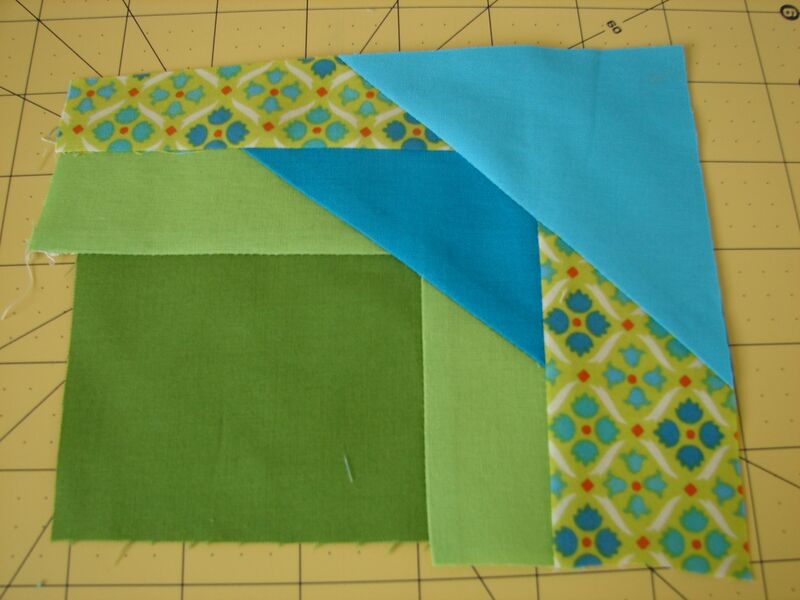 Fabrics: Grab some scraps and give this block a try. We chose primarily solids in analogous colors for our blocks with one hint of print just for fun! You’ll need a handful of strips from 1 1/2″ to 2 1/2″ wide. Make sure you have some at least 14″ long. 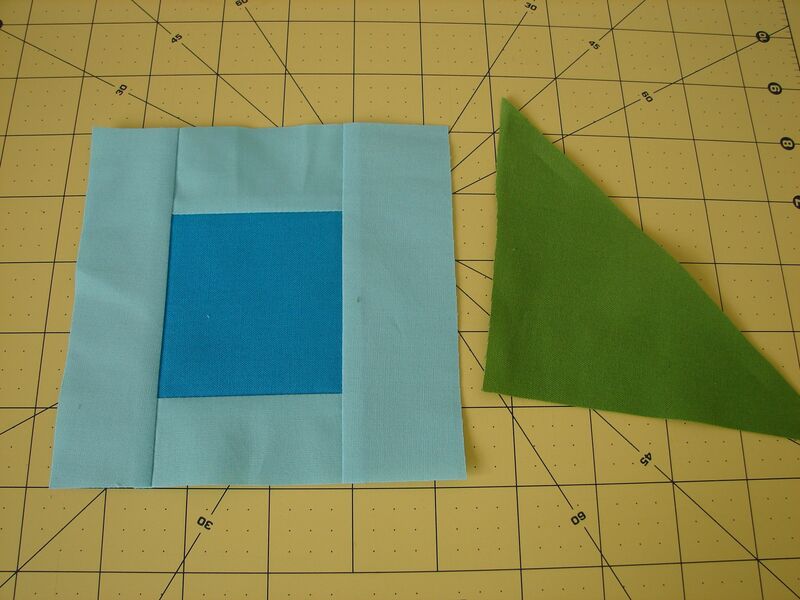 For the triangles you’ll need 8 or more square scraps from 4″ x 4″ to 6″ x 6″. These will be cut in half diagonally to make your triangles. The block requires 4 triangles for each round of logs you choose to add to your block. Cut a center. It can be any four sided shape. Feel free to make it skewed if you desire. Logs are sewn to the center courthouse steps style, sewing logs to the top and bottom of the center first and then to the sides. Cut two strips a bit longer than your center. 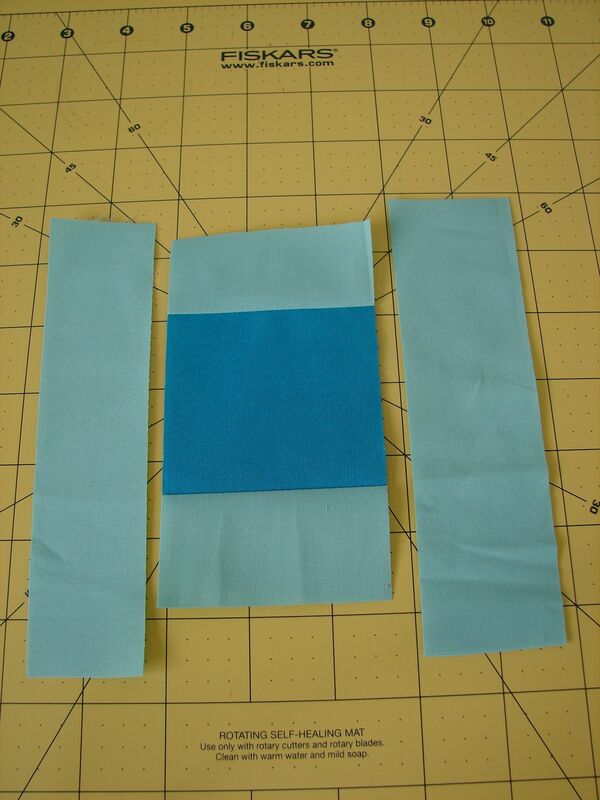 Sew the strips to the top and bottom of the center. Press seams away from the center. Trim the top and bottom logs even with the sides of the center. Cut two more strips a bit longer than the sides of the center. Sew to each side and again press away from the center. This will complete one round of logs. 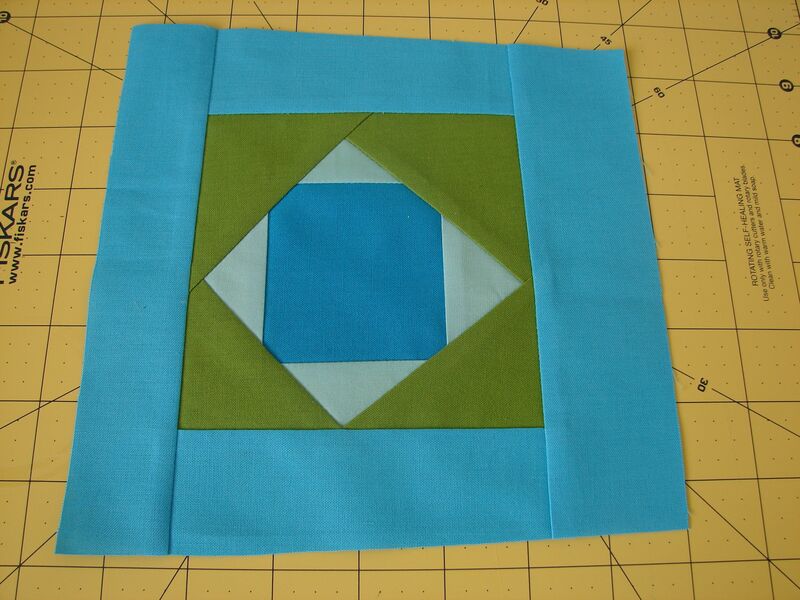 Cut two of your square scraps in half on the diagonal to create 4 triangles. The size of your triangles will depend on the width of the strips you use. The wider the strips, the larger the triangles will need to be. Place a triangle across one corner diagonally. 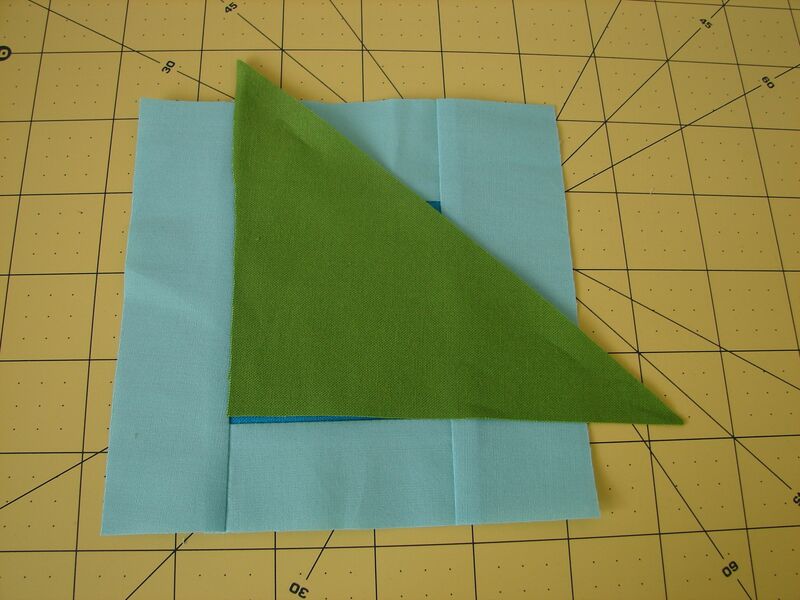 To make sure your triangle will cover the corner when sewn, do a test flip. To test, pin or hold the triangle on the seam line, flip the triangle over to see if it covers the corner. If not, adjust the position or choose a larger triangle. 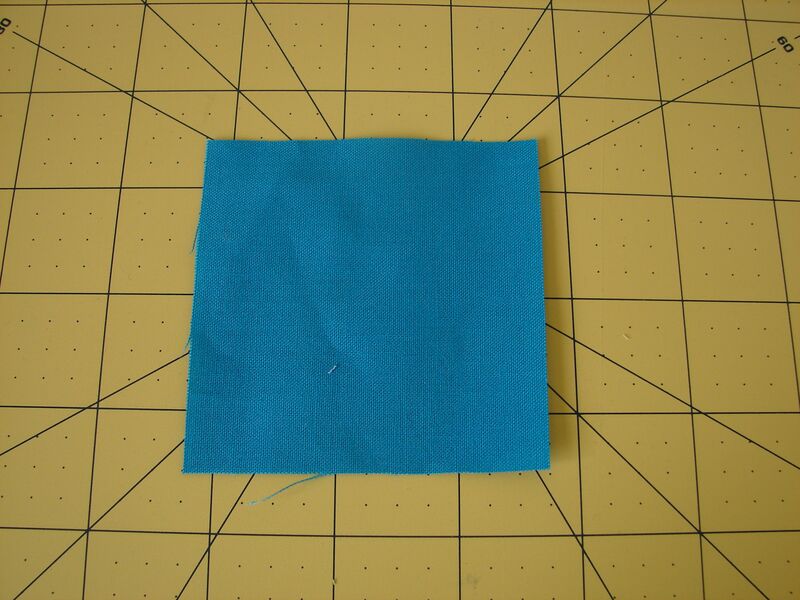 Sew a 1/4″ seam along the diagonal of the triangle. Flip the triangle and press. 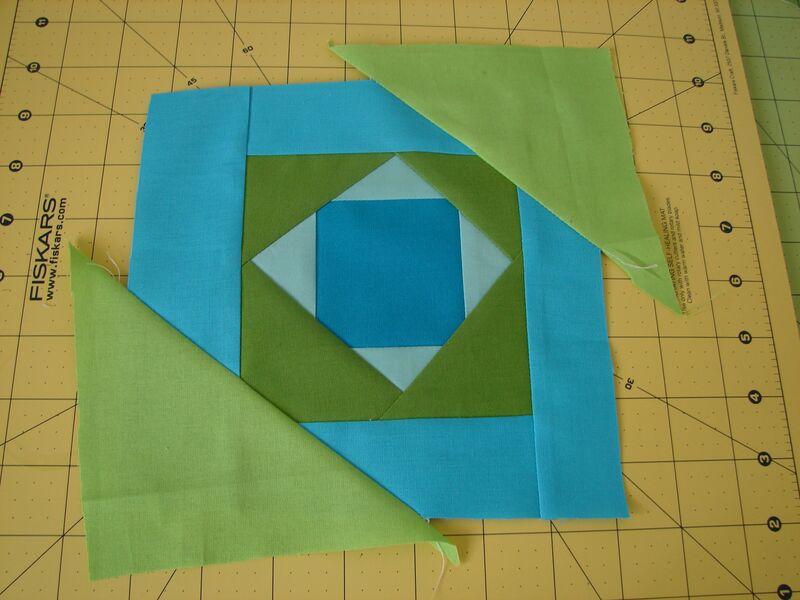 **Varying the placement angle and how far the triangle is in from the corner will alter the look of the block. 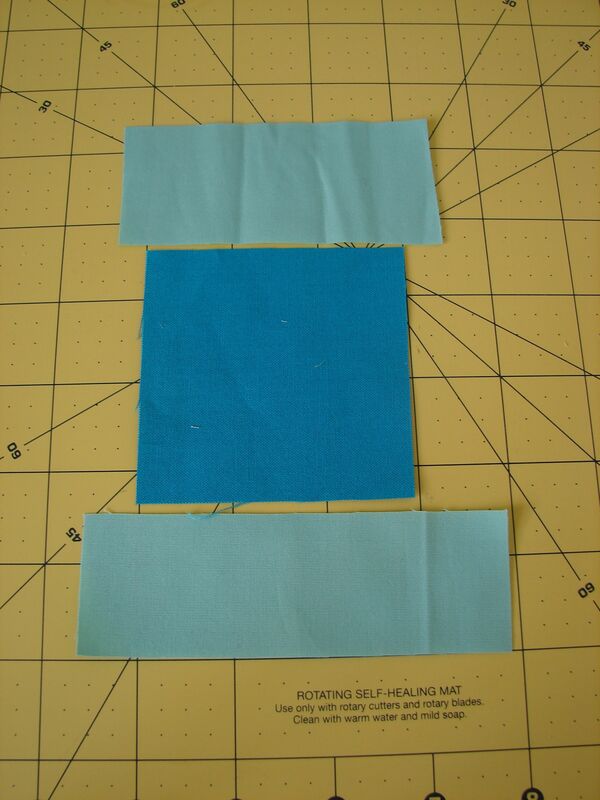 Note how the triangle in the picture above is placed so that it will overlap the center when sewn. 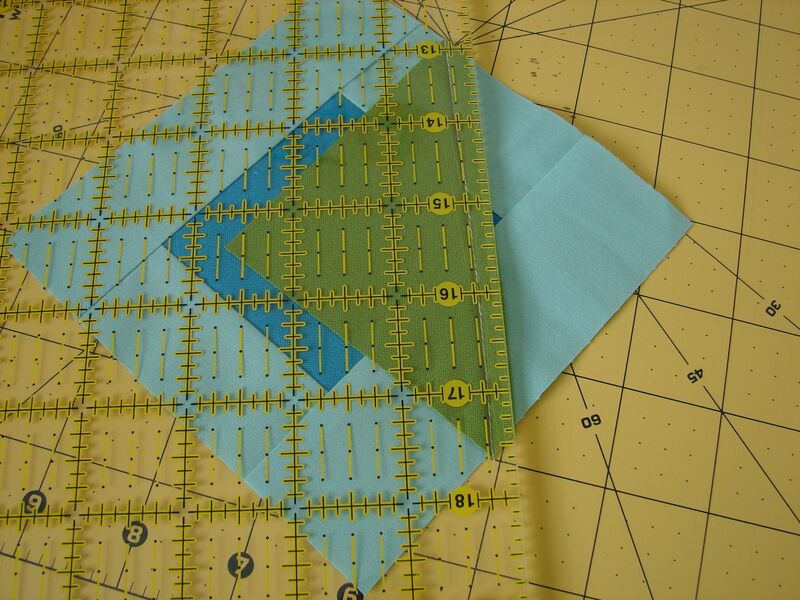 Turn the entire block right side down and use your ruler along the straight edge of the block to trim the excess triangle fabric. 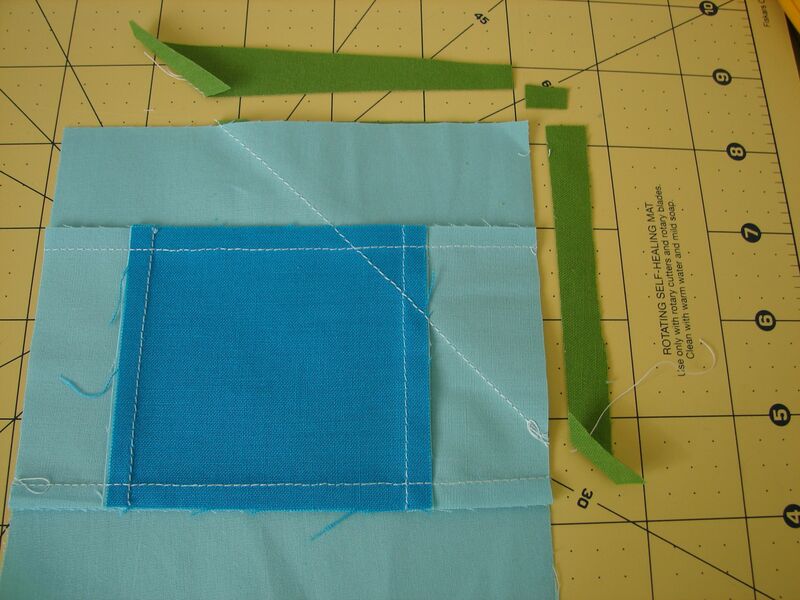 Turn the block right side up, flip the triangle back and trim the excess fabric underneath. Repeat this process three more times to add stitch and flip triangles to each corner of the block. Start the process again by adding another round of logs. Remember to sew strips to the top and bottom first and then the sides. Logs can be of any width you chose and feel free to angle them if desired. When the next round of logs is complete, it’s time to sew the stitch and flip triangles to each of the four corners. 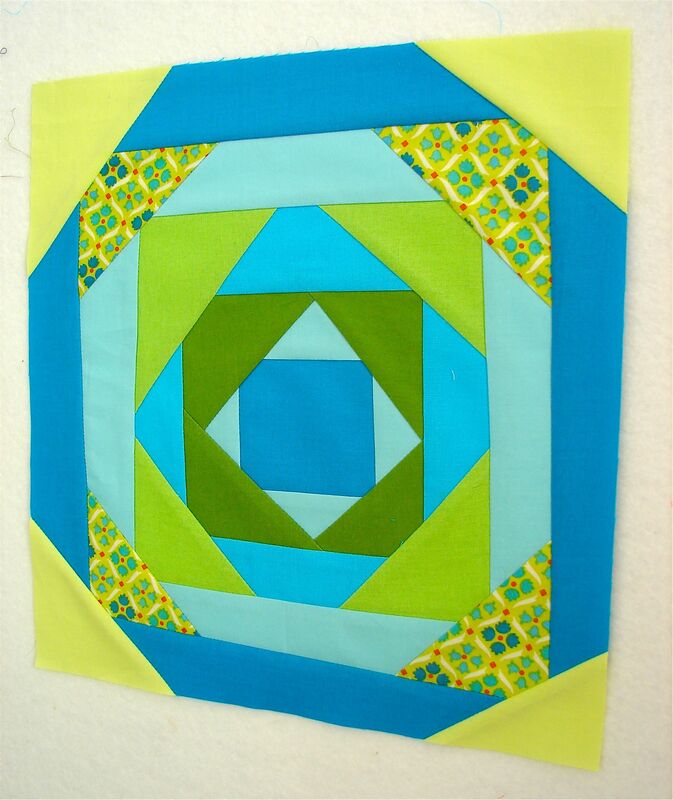 Varying the angle of the triangles will add interest to your block. 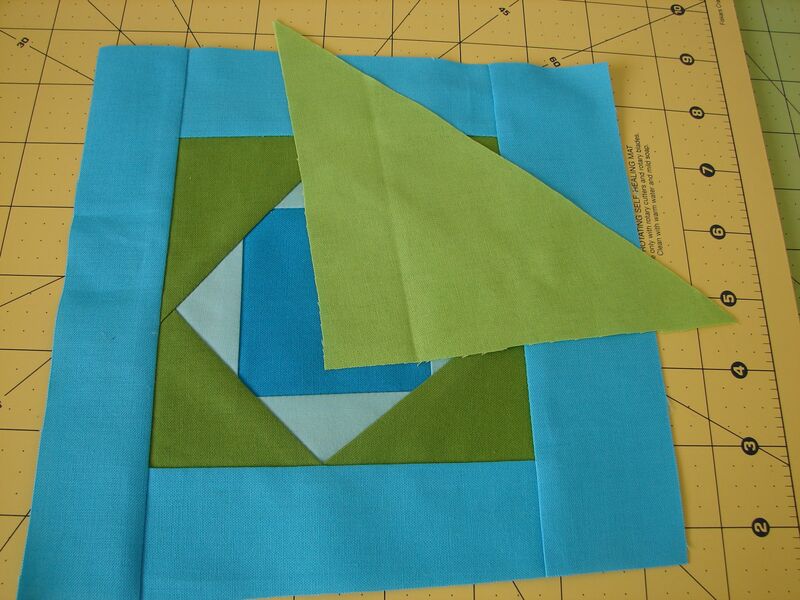 Notice how the triangle is placed so that when sewn will overlap the triangle in the previous round. To speed up the process, sew triangles to opposite corners, flip the block over and trim instead of sewing and trimming one triangle at a time. 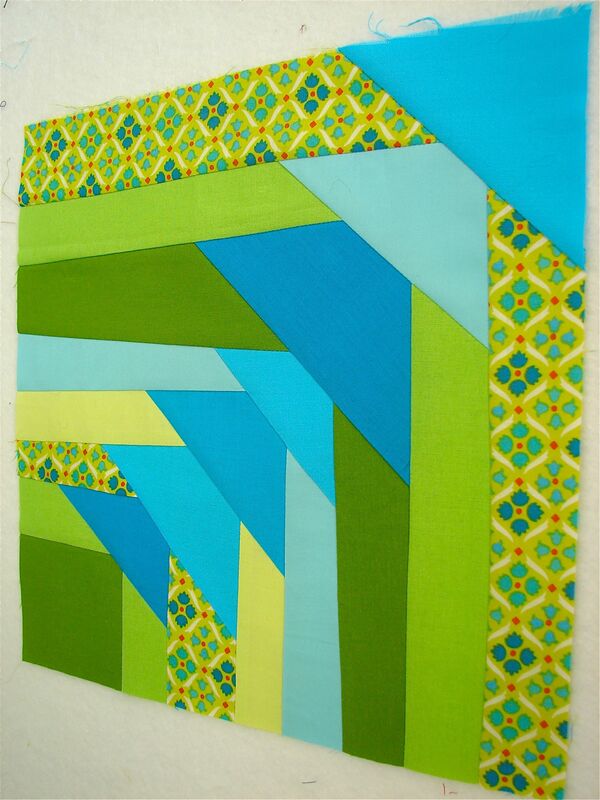 Continue the process adding rounds of logs and 4 stitch and flip triangles until your block reaches your desired size. Our block has a center, four rounds of logs and 16 stitch and flip triangles. To make the half log cabin variation. Sew logs to the top and right sides of the center. Then add a stitch and flip triangle to the top, right corner. Continue the process as many rounds as desired, adding a half round of logs and then a stitch and flip triangle for each round. There are so many possibilities to explore with this block. What would it look like if the triangles didn’t overlap, or if there were triangles added to every other round of logs or maybe triangles added to only one or two corners? Have fun and do some experimenting. 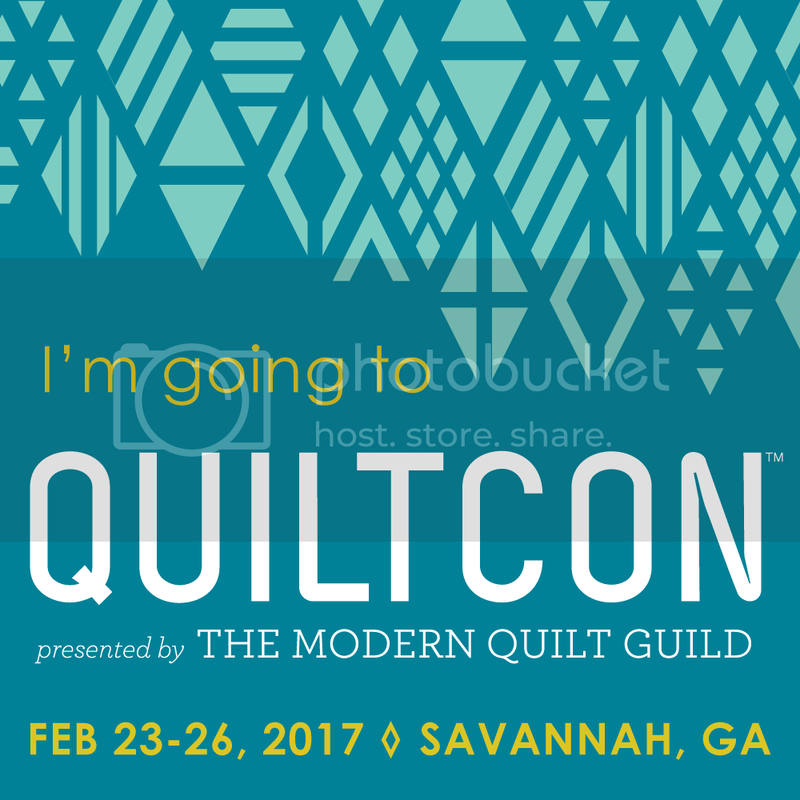 We’d love to see some improv pineapple log cabin quilts! Wow! Super gorgeous. 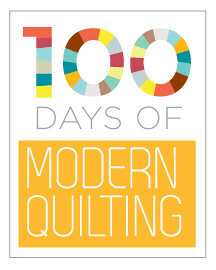 A pineapple quilt is on my list for 2012. Thanks for modern interpretation and the great tutorial. Bookmarking this to try soon! I agree! I love the tutorial! I’ll have to give this a try – seems like it’d be a great scrap buster, too! I absolutely LOVE this. I’m part of a solids bee this year, and I think I’m going to have my hive make these blocks for me. Such a great inspiration, thank you.